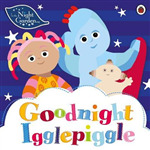 It's almost time for bed in the Night Garden, but first Igglepiggle wants to say goodnight to all his friends. This book features Igglepiggle, Upsy Daisy, and Makka Pakka. It's a bedtime read for little fans of the show.